Why does the devil have to be so damn scary? Just the very thought of him and his ability to take over an individual’s body and mind, against their will, is enough to make me go to church. While I’m completely convinced that there is a devil and that possession is real, others are still doubtful, despite the several cases of demonic possession. The documentary-style horror, “The Devil Inside” explores this idea more, revolving around a young girl and her mother who may or may not be possessed. Although the film started off steady, it abruptly ended in the middle of the action, leaving audience’s feeling cheated of a true explanation. The film opens with a 911 call made by Maria Rossi (Suzan Crowley), a mentally unstable woman who admits to murdering three people in her home. When a police crew enter the home, they are shocked to find a priest and two other churchgoers brutally murdered and spread about in Rossi’s home. At the time, investigators believe that Rossi just snapped, however, her daughter, Isabella (Fernanda Andrade), learns from her father years later that Maria killed the three people during an exorcism being performed on her. In order to decide whether her mother was actually crazy or if she was possessed, Isabella sets out to document her findings, hoping to prove her mother’s case. The young woman, along with a filmmaker, Michael (Ionut Grama), head to Rome, where Maria is being detained. While there, Isabella sits in on an exorcism class and is introduced to Ben (Scott Quaterman), an exorcist, and David (Evan Helmuth), an ordained priest. When Maria’s case is turned down by the church, Isabella turns to Ben and David to help. The two men perform exorcisms that have been turned down by the church because they believe that the individuals are truly possessed. 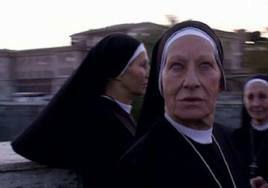 To show Isabella what exorcisms are like, the pair bring her along for one that they perform on a young woman. After witnessing the exorcism, Isabella is convinced that Ben and David can help her mother and despite some minor hesitation, the two agree to help by going through with an exorcism. Immediately following the exorcism is where the film seems to take a turn for the worse. There are several different things that happen at this point, and I had pretty much figured out what they were doing before they actually did it (ie. the transference subplot) because it was quickly foreshadowed at the beginning of the film. However, the way in which the events took place and the way in which they ended was completely chaotic and thrown together. The story was creative and a bit different than what we’ve already seen with other exorcism films and I do give the filmmakers credit for that; however, the execution wasn’t done correctly, which is why I believe many people hated the film. There were so many different elements and scenarios being thrown at us and just when things were really starting to get interesting and pick up–BOOM–the movie ends. The audience is never given an explanation to several bits of information that was presented to us and the way the film ended just seemed like a cop-out for the directors. It seemed as though the filmmakers did not know where they were actually going with their story and they didn’t know how to sum everything up, so, they just took an easy way out and ended it the way that they did. Other than the poor ending, I didn’t find the film to be as bad as everyone else was making it out to be. 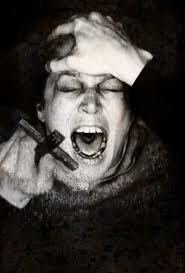 There are several interesting pieces of information related to the church and exorcisms discussed throughout the beginning of the film and those elements of the film drew me in. Many people in the audience around me did not take the film seriously but I found it to be intriguing, no matter how true or how fake the facts they were presenting were. A lot of people hated this film and I did not. I actually enjoyed the first half and there were various scenes in the film that actually made me and my father jump, which isn’t easy to do. The acting wasn’t completely horrendous and I particularly enjoyed Crowley’s performance as Maria and Scott Quaterman and Evan Helmuth as the two priests. Crowley’s Maria was completely terrifying because it bordered along the lines of insanity and possession; we weren’t really too sure what was going on with her. Helmuth’s David was a character you could easily empathize with because he came off as an extremely nice and pure person. I was disappointed that we didn’t learn more about Quaterman’s character because clearly, there was an interesting backstory there that we were cheated of learning. In my opinion, The Devil Inside was not half as bad as everyone made it out to be. The film started off well and it had a decent story going. What it all comes down to is the ending; the film ends so abruptly and we are not given any answers. I’m sure that the director was trying to present the film as a “real” scenario and in real life not everything is summed up nicely, however, they shouldn’t have created so many elements within their story if they never intended to explain them. I think that before jumping on the negativity bandwagon, you should go out and see the film for yourself because you may actually enjoy some of it, as I did. Just prepare yourself for a sudden ending that fails to sum everything up in the movie. I can't wait to see this movie. Unfortunately, there is no theater in my town and I have no car. Likely, I'll be catching it on DVD.